No matter what math curriculum you choose to use with your kids, they all need to practice their math facts. We normally use the old paper and pencil method, but lately we have been using Math Rider. Math Rider is an computer game where kids can work on their math facts for addition, subtraction, multiplication, and division from 0-12. This program download can be purchased for $47.00 with free lifetime updates. 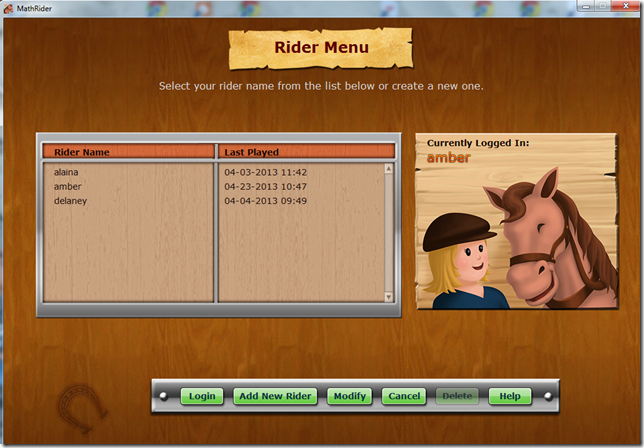 It is recommended for kids ages 6-12 and can be used with up to 8 riders. The system requirements list that it can be used on Windows or Mac. There is also a free 7 day trial of the complete program available. I didn't run into any problems while downloading the program and we were ready to start in just a few minutes. All three of my girls Alaina (age 8), Delaney (age 10), and Amber (age 12) used the program. Alaina worked on addition, subtraction, and multiplication. Delaney and Amber worked on multiplication. 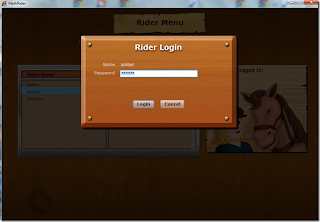 This is the Rider Menu that lists all the students so they can gain access to their saved program. 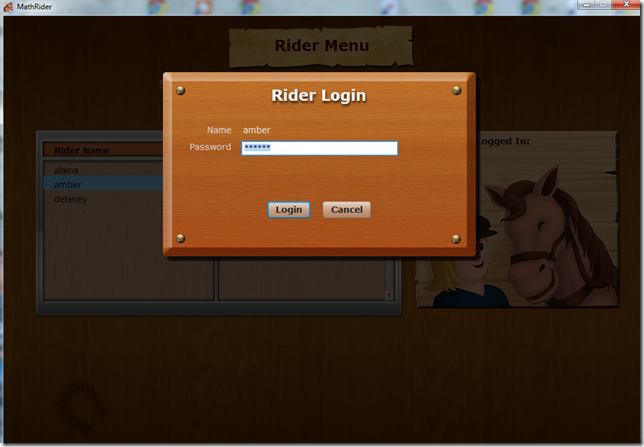 It is very easy for everyone to login to their account. 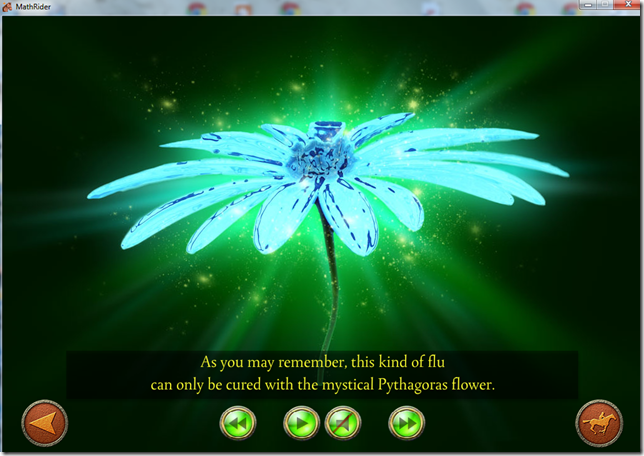 Each child has a home screen and once they have completed a level they get a flower, gem, or flag. 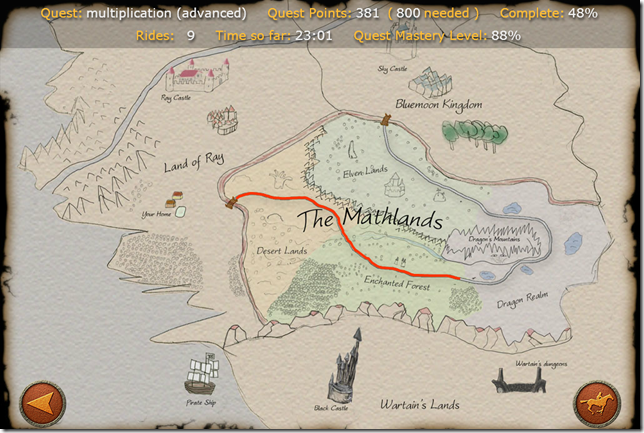 From the home screen you can proceed to your quest, start a new quest, view statistics, or view your map. This is the actual quest. 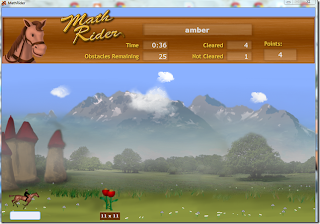 The horse is running across the screen toward the math problem. The faster the student answers the question the faster they come. If a problem is missed it is repeated again. After each section is completed the student will be shown how well they did. Green is good and the small bars mean the problem was answered quickly. A tall red bar means the student took longer to answer each problem. 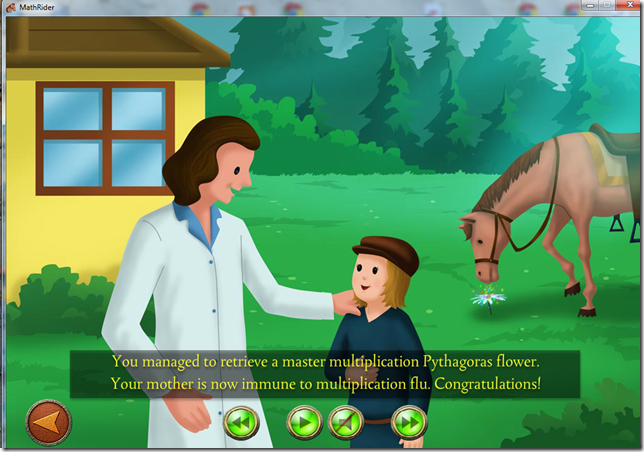 Easy Level Quest~ Your mother has the addition, subtraction, multiplication or division flu. You must find the Pythagoras flower (below) to cure her. Medium Level Story~ You must return the gem to the elves in Elven Land. Hard Level Story~ You discover the princess has been kidnapped by the evil King Wartan. If you get 100% in this level you can move on to the Mastery Level to rescue the princess. 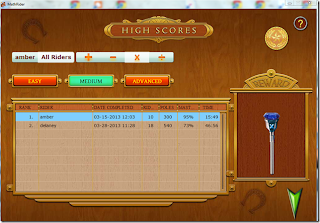 Statistics can be checked from the students home screen. 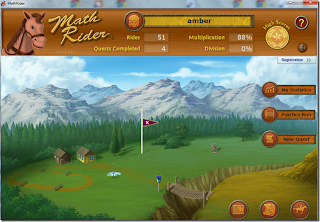 You have the option of seeing one students scores or all riders together for each math function and level. The Statistics chart is very easy to see how well the child is progressing. If the chart is red that means the child either hasn't completed that problem or they are having trouble with it. The color scheme for the Mastery Level is on the bar. 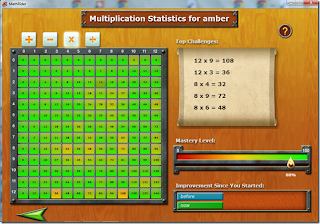 This chart shows that Amber has almost mastered the multiplication level. 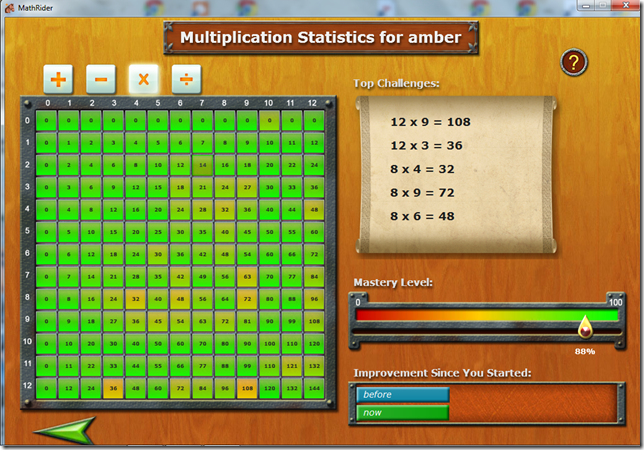 The math problems that she is slower on are listed in the Top Challenges box and are colored yellow on the chart. On the multiplication table you can left click to see the problem worked out with beads. If you right click you will be shown a box with two up arrows, one is blue and one is green. The green arrow will show a percentage of improvement. If your cursor hovers over the chart it will show the multiplication problem with the answer. All three of my girls enjoy using Math Rider. We only had it downloaded on one laptop and some days they all wanted to use it first. 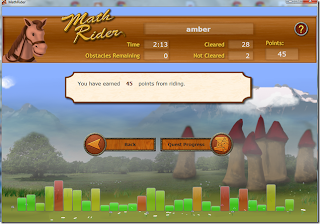 Amber already knows her math facts, but after using the program she has been able to answer the harder ones much faster. Alaina is my child who likes math and she was very happy to play Math Rider over and over. Just in the last couple of months she has increased her speed in answering her addition and subtraction facts. She knows some of her multiplication facts and this has already been helping her learn more & retain them. Delaney does not like math at all!! 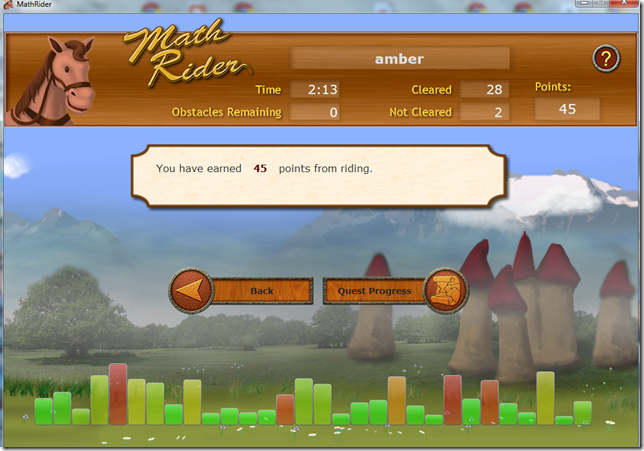 I have noticed that she hasn't complained about her regular math lessons as much after using Math Rider for awhile. I think because she is actually retaining her multiplication facts and it makes her math lessons easier. 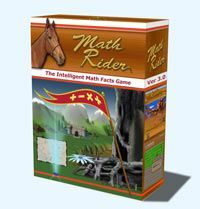 We received access to Math Rider for one year and I think I will purchase it after the year, it is well worth $47.00. I don't have to print copies of our speed drills and my kids are volunteering to work on their facts.